Natalie Overstreet is a registered, licensed dietitian who began writing professionally in 2013. She specializes in nutrition for LIVESTRONG.COM. She received a Master of Science in human sciences from Stephen F. Austin State University, emphasizing in food, nutrition and dietetics. Overstreet currently works as a clinical dietitian and health educator in East Texas. Americans spend almost $800 million a year on peanut butter, and this popular food is eaten in 90 percent of American households. Peanut butter is an excellent source of protein, unsaturated fats (the heart-healthy kind of fats) and B vitamins. Due to its nutritional value, long shelf life and versatility, peanut butter is a staple in the American diet. The most common way Americans use peanut butter is by making a sandwich with it. Calories will vary, based on the types of ingredients chosen. The standard serving size for peanut butter is 2 tablespoons. 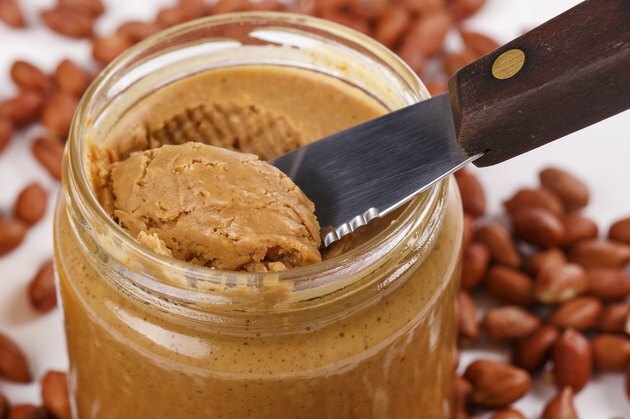 Both chunky and smooth peanut butter contain approximately 190 calories per serving. Peanut butter is available in a reduced-fat version. However, this version contains about the same amount of calories per serving as regular peanut butter. Typical choices for sandwich bread include white, wheat or whole wheat. White bread contains approximately 74 calories per slice. Wheat bread contains approximately 77 calories per serving. Whole wheat bread contains approximately 81 calories per slice. Popular additions include jelly, jam, honey, maple syrup, chocolate, bananas and dried fruit. Adding any of these ingredients to your sandwich will add calories, as well. One tablespoon of jelly, jam, honey or maple syrup contains about 60 calories. One medium banana has about 100 calories.